I had been feeling a bit off track with Weight Watchers all week due to the stress and disorder of trying to get ready for our trip. I got about what I would have expected when I weighed in on Saturday. I gained 3/4 of a pound. Not bad but it’s still a bit frustrating. I know I have to be more mindful and make better choices. I think part of my trouble this week is the fact that I haven’t been eating 3 meals a day. Gotta get back on track with that. I’m not really upset. I’ll be weighing in early this week on Friday so we’ll see how we do. I just hope I’m able to find a meeting when we get to New Mexico. I can’t go for an entire month without a meeting. 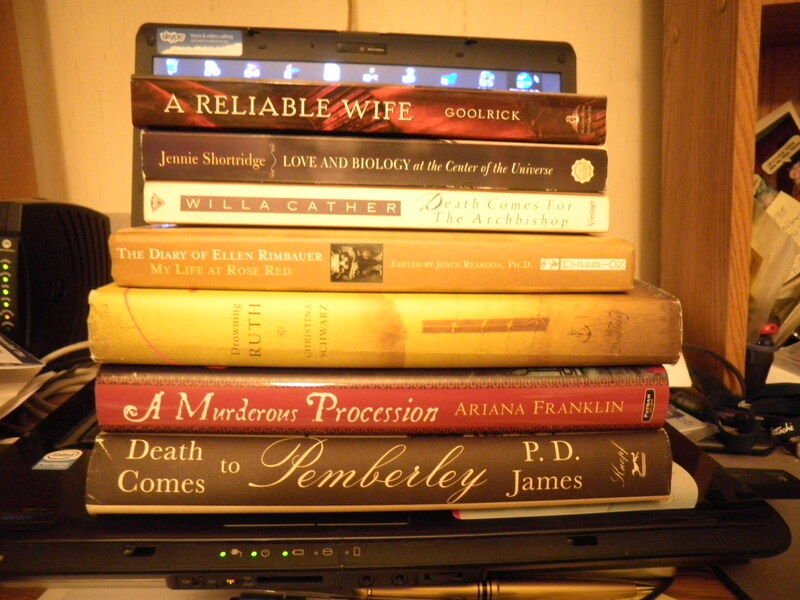 I mentioned that there was a library book sale on Saturday. Initially, I was not going to go. I didn’t even mention it to Ralph or Ele. I thought Ralph would say no…To my surprise he said…”Call Ele and we’ll go.” So I did, and We did! I think they’re a nice selection, but now I have to open my already packed book bag for the trip and make some substitutions. Either that or I’ll have to graduate to an “annex” bag. I was most excited to find A Reliable Wife by Robert Goolrich. I recently read his Heading Out To Wonderful and I liked it. Also glad to find the Ariana Franklin book. It’s part of her Mistress of the Art of Death series. I’ve read the first, have the second (packed away somewhere I think??) now I have the third. Willa Cather’s Death Comes For The Archbishop is set in New Mexico, so that one needs to come on the trip with me. No actually the bad things are what I allowed myself to eat on Saturday. Not a good food day, but everything was written in my tracker and Today is a New Day!! I’ve got to keep myself on track. And it’s not raining so as soon as I tie on the old sneakers…I will hit the pavement! Thanks for all of your support with my walking!! Happy Sunday!! 1-2-3-4–Here I go Out the Door!! This entry was posted in Uncategorized and tagged books, Ultimate Blog Challenge. Bookmark the permalink. hope you had a lovely walk, fran! i am heading out now for my run so we can be virtual fitness partners this morning! ok, that is super fun that you went to the book sale – we can blame ralph as he gave the a-ok…and yes, to limit yourself to just those books…wow! restraint! but now i am going to give you the ok to go back today! !…hey, reading is one of your favourite hobbies and at those super prices, you should stock up! have a wonderful day, fran! i am OFF today (!) and intend to make full use of the gorgeous summer weather and my free time. Have a great run, Cathy and a Wonderful Day!! I love the idea of us being virtual fitness partners! Excellent!! I do think I’ll restrain myself and Not go back to the sale today. I’m doing something fun with Ele since after this week, I won’t see her for awhile… 😦 Happy Sunday! Good scores on the books Fran! I read a Reliable Wife and enjoyed it and I love the Mistress of the Art of Death series. I really wish I’d gotten on Goodreads years ago! I am not sure how far retroactively to put them on there. Maybe I’ll at least load up those that are still in my closet! Enjoy your day! Stacie, glad you approve of my finds! I have a bunch more to list on Goodreads. I should bring my book log into my computer area and just put in a few at a time. I keep forgetting to do that. Of course, it won’t happen until after our trip now!! Have a great day! I’m hoping to pick up some reading again (fresh college graduate here, lol spend my last 5 months cramming in school books), got any good books recommendation? Hi Carolyn! Welcome Back! Click on my Goodreads 2012 Reading Challenge button and you’ll see everythin I’ve been reading lately. If it doesn’t work (although it should) let me know and I’ll send you a link! Glad you’re back!! Thank you, Stacie!! Yes, I will reserve the right to answer when I get back. Maybe I should print it out and work on it while I’m away. That’s a good idea! Thanks!!! I definitely need to get some new books on my kindle! Hi Liz!! Yup…that’s great advise and what I try to go with. The Nook is calling my name, just can’t make the commmitment yet. Have a great day!